Oh, I do wish this lovely landscape painting by E.W. Haselhust R.B.A. was a bit bigger. But, it’s so lovely that I just had to share it with you. Once again thanks to that 1923 aspect of American copyright law, according to Gutenberg.org, this image and all of the others in the same book entitled “The Thames” is copyright free for us Americans. Haselhust (12 November 1866 – 3 July 1949) was a British watercolorist. His work is prominently featured in a lovely set of landscape and travel books showing venues from around England. Hampton Court is most well-known for the royal palace located there. 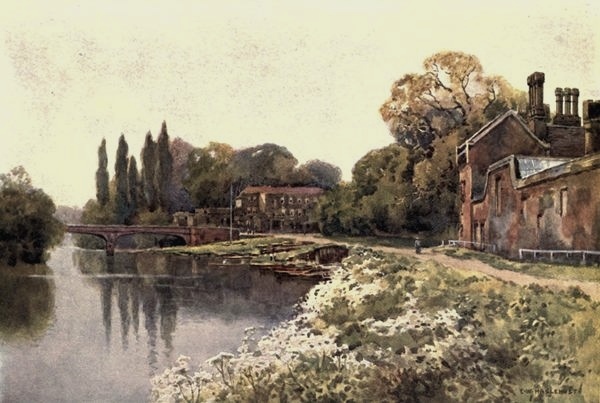 This landscape painting doesn’t feature the palace but instead shows a quiet bit of English countryside with a bridge across the Thames and the flowers the area is also known for.